Offering this nice clean 14" long x 2" wide cutter, Stanley Bailey No 5 Jack Plane Type 18 with the corrigated bottom, dated 1946-47; blade is marked "Stanley" with the rectangular logo, and "MADE IN U.S.A.". This particular plane has like new solid rosewood knob, and tote handle, very nice! 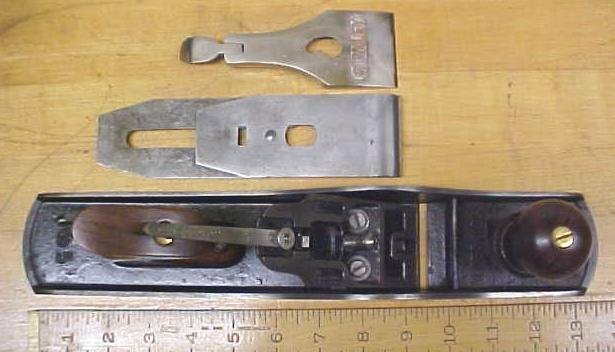 Otherwise this plane has all the features of a type 18 plane, but the original plane was said to have been sold originally with black painted hardwood knob and tote, this one has rosewood. The plane is in very good condition with some wear on the original black Japanning, but over 95% still intact; bear metal surfaces good++ condition, no cracks or chips; clean, minor light staining or darkened color. The 2 inch wide blade is very clean, ready to work, no cracks or chips; cutter is 98% and sharp. Overall condition is good++, to very good with very little wear noted, very nice, super clean plane for your collection and/or use! Items Similar To "Stanley No. 5C Jack Plane Type 18"